Contaminated sites and facilities may pose significant risks to the local populations because of the potential health and environmental effects associated with environmental contamination problems. Also affected are property owners and financiers due to reduced property values and possible financial liabilities. The effective management of contaminated sites is therefore an important environmental issue, requiring careful planning. This book addresses the issues relevant to the investigation and management of contaminated sites, emphasising problem diagnosis/characterisation and the development of site restoration/corrective action programs. The book focuses on methodologies that will allow scientifically justifiable/defensible, technically feasible, and economically viable corrective action assessment and response decisions to be made. This includes methods for developing effectual site restoration tasks, methods for evaluating the progress of corrective action programs, and the application of risk assessment methods as a decision-making tool. The goal of the book is to synthesise technically sound principles and techniques that can be applied globally to contaminated sites in different regions of the world. 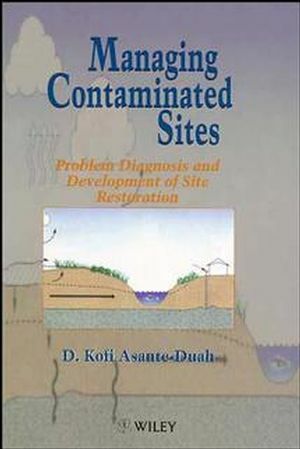 D. Kofi Asante-Duah is the author of Managing Contaminated Sites: Problem Diagnosis and Development of Site Restoration, published by Wiley. Contaminant Fate and Transport in the Environment. Elements of a Site Characterization Activity. Risk Assessment as a Diagnostic Tool. Development of Risk-Based Site Restoration Goals. Evaluation of Site Restoration Options. Development of a Site Restoration Plan for a Contaminated SiteProblem: An Illustrative Example. Design of Corrective Action Response Programs.